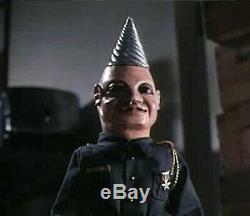 Tim Dornberg "Tunneler" Puppet prop from Puppetmaster 1-5. 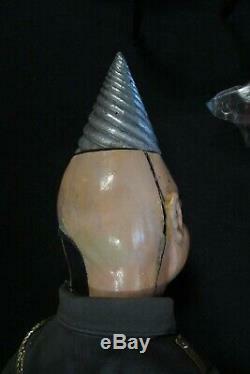 Original "Tunneler" character puppet with drill bit head. Constructed of foam latex, vacuum formed plastic, cast resin, metal and fabric clothing components. Puppet wears a WWII German military uniform. The 25 x 6 in. Puppet figure is expertly assembled, painted and finished. Exhibiting wear and production use with the head removable from the body. 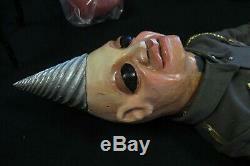 The item "Tunneler Puppet prop from Puppetmaster 1-5" is in sale since Friday, March 29, 2019. This item is in the category "Entertainment Memorabilia\Movie Memorabilia\Props\Originals". The seller is "fkillzer" and is located in Fort Dix, New Jersey. This item can be shipped to United States.